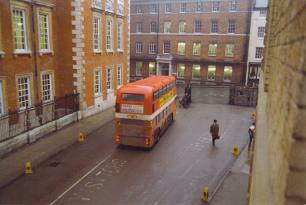 At first glance this appears to be just a rather unremarkable photo of a bus in a street on a gloomy wet day. At one end of this short road are ornate gates, and if you’re observant you’ll have noticed that on the wall at either end are small signs referring to the ‘Highways Act 1959′, and declaring that this is not a public right of way. It’s still a private road. The Cedar Court Grand refer to the ‘private road’ status when answering queries regarding parking on tripadvisor.com. Who owns it now? 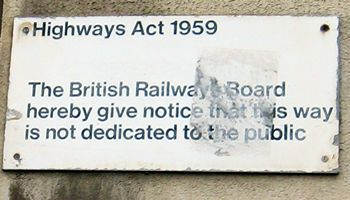 Do the ‘British Railways Board’ still exist? Do they own lots of random small bits of road all over Britain? So, back to the bus. The private road was opened to traffic during one of the floods. Before our flood defences were installed/improved, the river levels in the city centre rose so high as to flood streets close to the rivers. Rougier Street, the normal bus route which runs parallel to this road, was presumably so flooded as to be impassable. This opening of the ‘gated close’ to everyday traffic was clearly of interest to the railway office workers, one of whom was my dad. This photo was taken from an upstairs window of West Offices, in January 1982. Any memories of this/information on the quirky little ‘BR’ road, please leave a comment. The bus livery looks like it is the Poppy Red of the National Bus Company – so not unlike “the ubiquitous livery of First, Arriva and Stagecoach”. (As a Hull lad, I watched as the NBC destroyed the perfectly good EYMS livery by forcing a switch to the same Poppy Red). What colour was the EYMS livery? Red buses are I think more aesthetically pleasing (as are red phone boxes and red post boxes) than any of those purple beasts which have been roaming our streets recently! EYMS were indigo and primrose – much nicer than the current scheme, but the NBC Poppy Red was such a shock to the system. There are a few EYMS buses on the Heritage circuit in the old colours, and as York was served by East Yorkshire there should be photos of them in the City. Thanks Andy – I now know the scheme you mean.